This Portal 4-CD collection includes two original John Coulton tracks and GLaDOS goodness. 4-CD's worth of Portal tunes, including Coulton's "Still Alive" and "Want You Gone" - as well as over seventy other tracks - will be available for sale on October 30th. This comes to you courtesy of Ipecac Recordings, the on-a-shoestring label that allows music that might not otherwise get a release to find its public. Disc 4 is the one Portal fans will be particularly interested in, as it includes 13 tracks from the original game that, until now, weren't available. The other three discs are full of Portal 2 goodness, including "Want You Gone" and "Cara Mia Addio", both featuring vocals from Ellen McLain as GLaDOS. The collection also has Coulton's iconic "Still Alive"; "Still Alive", of course, is on that pesky fourth disc with all the other original Portal tracks. Also worthy of note is the mini-comic, "Turret Lullaby", which will be bundled in with Songs to Test By. Can Aperture's top scientists design a baby-friendly turret? Weeeeelll ... kinda. Bear in mind this is a physical release, not a digital download. 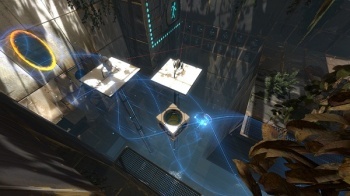 Digital versions of the Portal 2 tracks are available for free here. Of course, they don't include the vital Disc 4 content; those of you who want the original Portal tracks should be headed to Ipecac.